The wave of mobile push messaging has opened a new permission-based communications channel for companies to connect intimately with their best customers. However, leveraging push effectively inherently demands particular rules of engagement or "Good Push" so that the intrusion that it represents remains a welcome one. It must be relevant, informative, useful and timely. Push messaging is a permission-based mobile customer communication channel. The world is close to having 1 billion Smartphones with the majority of those users viewing their phone as a vital extension of themselves whether at work or play. The "privilege" of having a customer opt-in to receive push alerts is significant and opens up a new valuable channel for a company to communicate directly with the consumer. Equally significant is the ever-increasing pressure from new mobile apps vying for extremely competitive real estate on a customer's Smartphone screen. This informative e-booklet, from Urban Airship, the largest provider of push messaging in the world provides a useful primer to this staggeringly powerful communication medium. 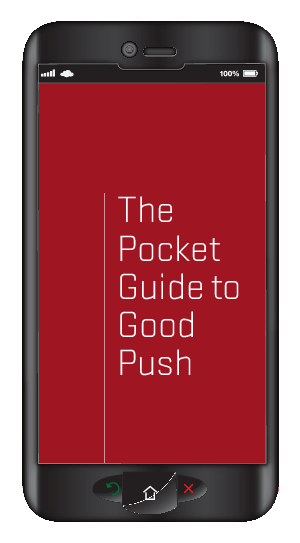 By sharing numerous examples of "good push", this guide will engage and inspire marketers everywhere to explore cutting-edge ways to meaningfully engage and offer true value to their customers through mobile push messaging. Simultaneously, it suggests "7 Rules of Good Push" to help marketers maximize their relevance and value to their customers. Truly vital reading for marketers everywhere looking for effective ways to harness the promise of this exciting communications medium.